Where's these pics then, widlejon. 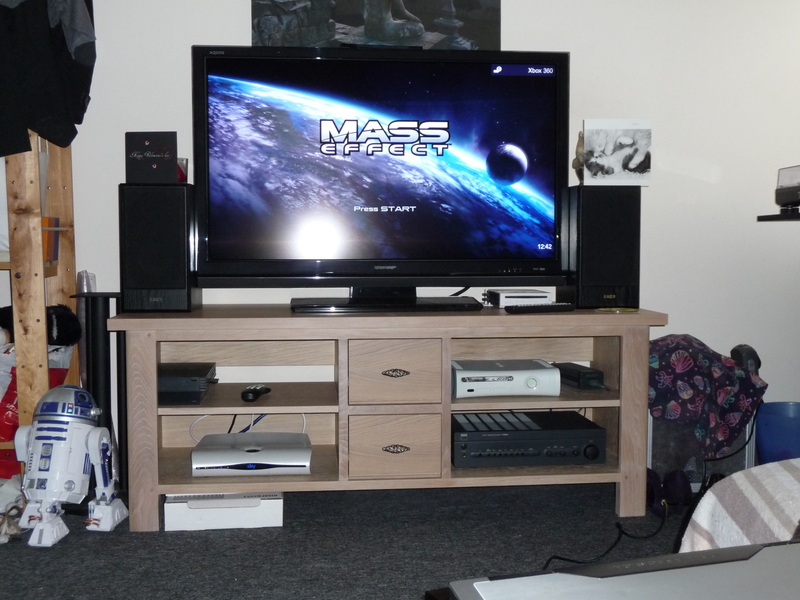 Since my Wii now resides in the bedroom and is being played more because of it, here's what it looks like. Old-skool cool. 17" Sanyo CRT with Wii connected via official RGB. Also, a freeview box and DVD player, for the wife. All connected via RGB using the Vivanco switch box. The TV gives a brilliant picture actually, much better for standard def stuff than my LCD, which is to be expected. My Wii collection is now in one of these, with the cases stored away. I FINALLY have my TV stand... with a spare space, not sure what to put in there yet, its kinda PS3 shaped right?! with a spare space, not sure what to put in there yet, its kinda PS3 shaped right?! That's a nice stand, wildejon. And a bloody massive photo! Redirected here by Ed after contacting him asking what happened to DS-WiiFi. Here is my setup. Only had my XBox Arcade for a month or so, more in to PC Gaming but slowly moving across to consoles. My last console that I proper played was my SNES in 1992 or so!!.. I had a Wii for about 2 months but sold it on as I got bored quickly. So far though, the XBox is holding my Interest, good job Microsoft! The TV is an Acer AT3222. The Tower Unit is an Acer Veriton M464. It runs my Media Centre, Internet Streams, World of Warcraft, GTA IV + some other games. Warcraft is getting tiring, My Epic gear beats your Epic Gear, purple, raid, item, oh i didn't win the roll blah blah blah zzzzzzz. I have a choice of 3 Acer laptops (Travelmate 6592, Travelmate 6292, Aspire 9500) to play other games on, and stream wireless HD Content to my TV both downstairs and an Acer LCD in the bedroom. Oh, I forgot the collection of Childrens Books which I have to read everynight to get some peace and quiet and Gaming time! Yeh lol, Acer are amazing - I work for them. Nice setup man! Good to see you coming back to the consoles after some time away. It's been too long. Well I've brought the Wii back downstairs now as I was missing it in our TV unit, and it wasn't being played so much in the bedroom after all. I've got the sensor bar under the screen as opposed to sitting on top, and it seems to be more responsive and accurate when sat on the couch now, which is a bonus. I still have the Wii games in a wallet, too. Stands out a bit, doesn't it. Awesome mate. The red is indeed very bright!! my room is tidy so i thought i'd take a picture. Thought I'd move things around a bit and this is what my setup is like now in preparation for Forza 3. Yeah, it's a bit excessive isn't it? I prefer the 3 TV setup I saw a while ago. Thats ridiculous! but i love to have it! My gaming setup is kinda tame, but I'll post it for the comic relief factor. Here it is. Pictures will come later. My Pc is my main gaming device. it's an Intel Core 2 Duo E7500 running at 3.2 Ghz, with 4GB DDR2 800Mhz ram, on an Intel G31 Motherboard. It has an Nvidia GeForce GTS 250 SLI graphics adaptor with 1024MB GDDR3 onboard ram, and an Asus Xonar DS High Definition 7.1 Channel PCI sound card. It runs Windows 7 Ultimate, using DirectX 11, and is paired to a wired MadCatz Xbox360 gamepad for the games that need it. Next is the Xbox360. I've got a gen 1 arcade machine, with a 20 gig harddrive. It was given to me by a friend who had 'Red Ringed' it but couldn't be bothered to get it fixed. I sent it to Microsoft, and it came back 2 weeks later good as new. I've since bought for it two wireless gamepads, a new 20 gig hardrive, and a headset. Oh, and some games. It is linked to the Pc via a wired network, and I use a 24 inch CRT tv. Both Xbox360 and the pc are in the bedroom I share with my wife. She's not a gamer, but uses the Xbox360 for DVD and Divx playback. In the living room, I have a 32inch Panasonic CRT widescreen tv, a Sky+ box, a Philips DVD recorder with Divx playback, a very very loud Sony HiFi, and my family's Wii. My 14 year old son has a PS2 black slim, that he's had from new, and still loves to bits. And there are 6 Nintendo Ds' in the house. I have 2, a black lite, and an old silver phat that I take to work. My wife has a powder blue lite. My two daughters have a lite each, one white, and one pink. My son has another black lite. We also have, not currently connected, a Sony Playstation, a Nintendo 64 Pokemon version, a Nintendo Gamecube, a Sega Genesis (not Megadrive, mine was an import that played usa and japanese games as well as uk), an original Gameboy (the white one with a green screen), a Gameboy Colour, a Gameboy Advance, a battery operated gamepad that has 101 original NES games built in, and a Commodore CDTV.